I knew I was going to have the kids to myself this weekend, so it was the perfect time to be the hero and break out a cool new toy to play with! I wanted it to be something I could get into too (is that selfish? 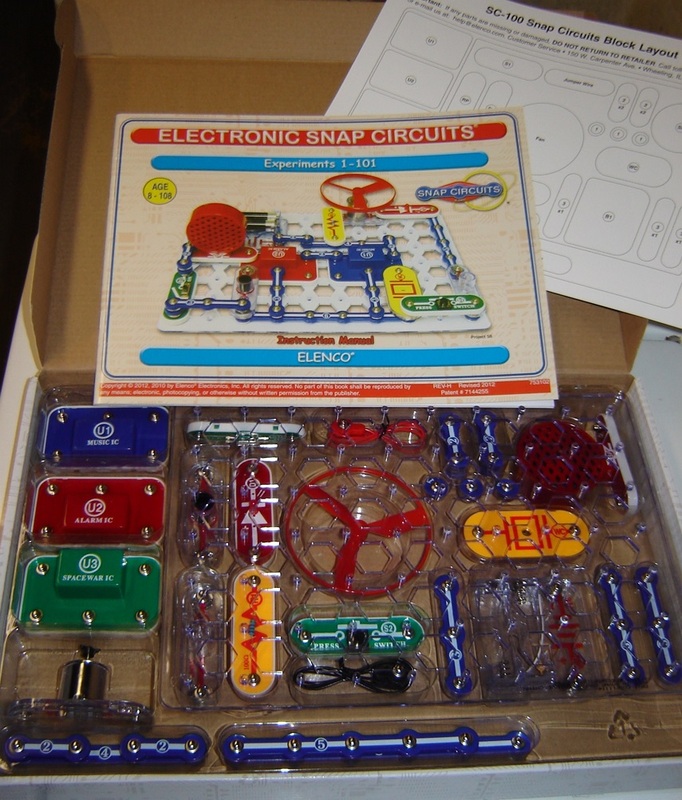 ), so I purchased a set of Snap Circuits Jr, which I keep hearing good things about. For the review-conscious like me, ratings for these sets (there are different expansion sets too) are off the chart, and are reasonably priced (this one was only $25). Here’s the kit immediately after opening. Everything’s packaged neatly and securely, with a full-color manual of 101 experiments and a layout sheet, to serve as an inventory of parts. It also shows the kids where everything goes (hah, yeah right) if the planets are aligned and they clean up afterwards. Who the heck wants to read a manual, amiright? 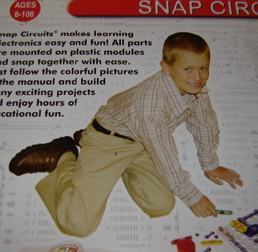 Just let me.. ya know… snap things on and stuff! 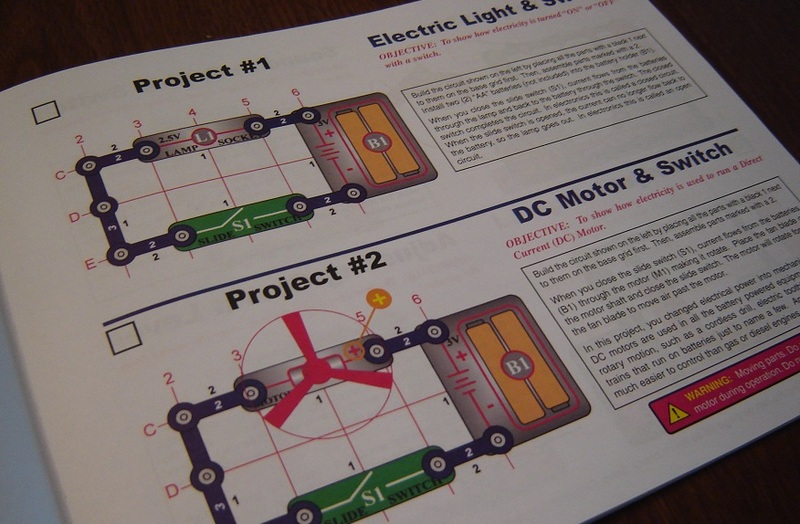 Actually, the manual is laid out nicely, and each project is its own mini-lesson. It states the objective, so you know what you’re working towards. Then it describes the project in more detail (seen in the black box below), explaining what some of the parts do and how they work together. Projects are organized in such a way as to be really simple at first, then increase in complexity as you go on. The first thing we did was start… at the start. 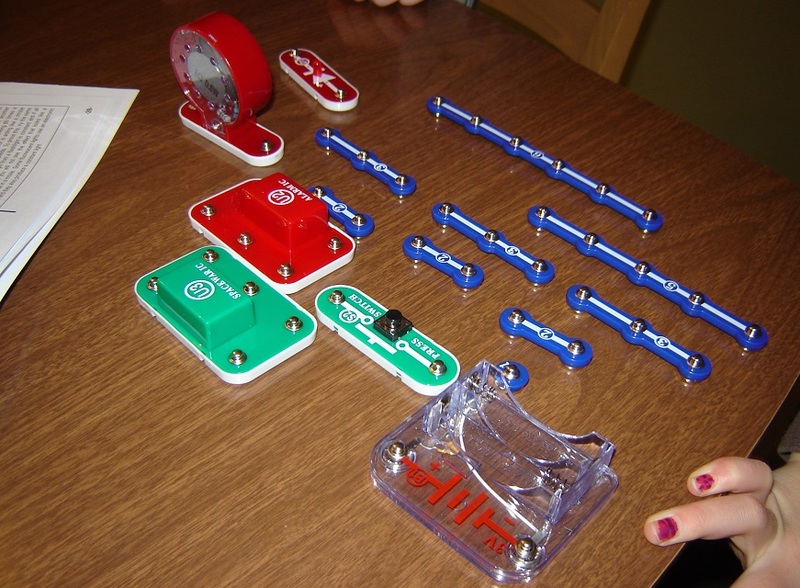 A simple switch and light bulb is the first project. Let there be light! Swap the lamp out for the motor, and you’ve got a cool (no pun intended) fan. In all projects, the clear “board” serves the purpose of a circuit board, providing a surface on which to build your project. The pieces easily snap on and off. 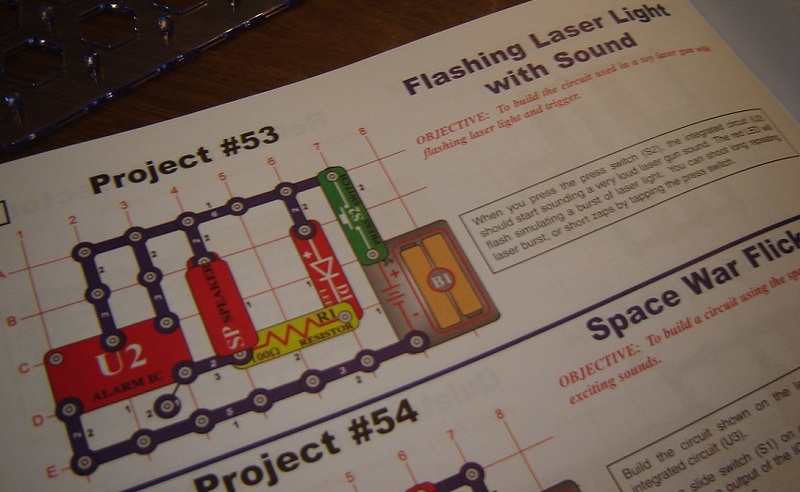 Of course, after building their first lamp and fan, what young scientist hasn’t immediately built a LASER beam? 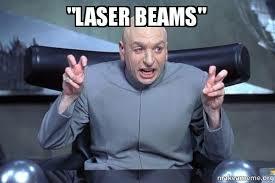 This one was a little more complex, but then, a LASER should be more complex than a fan. There aren’t step by step instructions, so sometimes it takes a minute to layer the parts correctly when you’re doing the project. Looking at D4, for example, it’s a little difficult to tell whether the speaker or the blue connector is topmost. Starting to set aside the required parts first. Laying the pieces out and giving it a whirl. **TIP: **There are some “connectors” that don’t actually connect anything. They look like coat buttons. They’re actually risers that help connect multiple pieces that are stacked on each other. 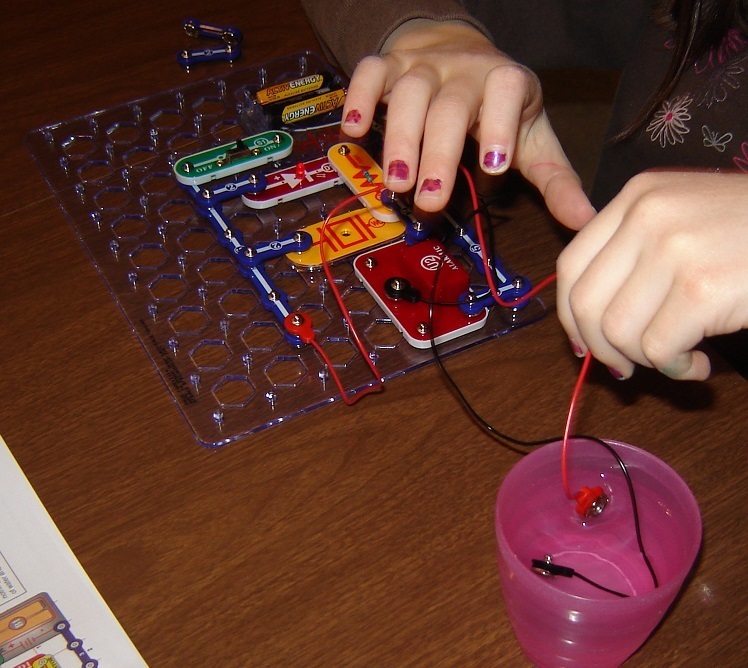 My daughter found this one, and it’s a pretty neat experiment demonstrating conductivity through water. 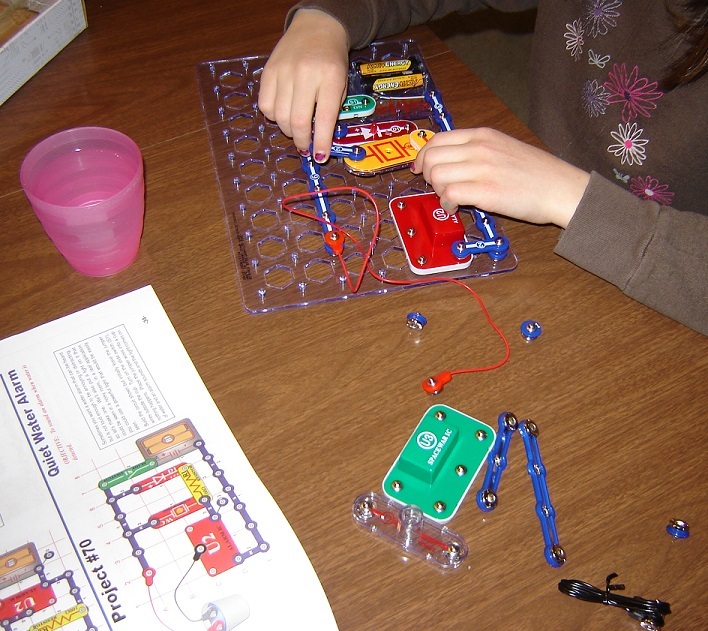 I was standing by to help when they needed it (mainly double-checking at the end), but they both (8yo and 6yo) were able to do these experiments on their own. Color-coding all the pieces was a great idea. 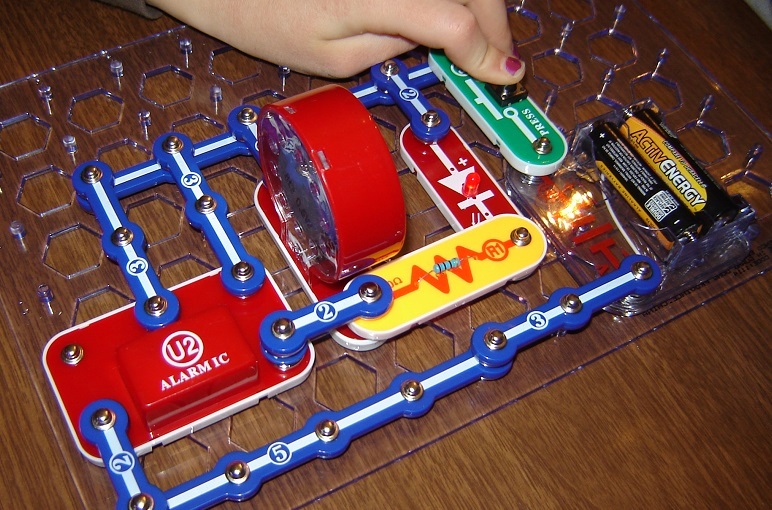 Dipping the leads in the water emits an alarm sound (the red box) and causes the LED to light up. The paper towel wasn’t actually for wiping up a mess, although the water did manage to splash around a bit. 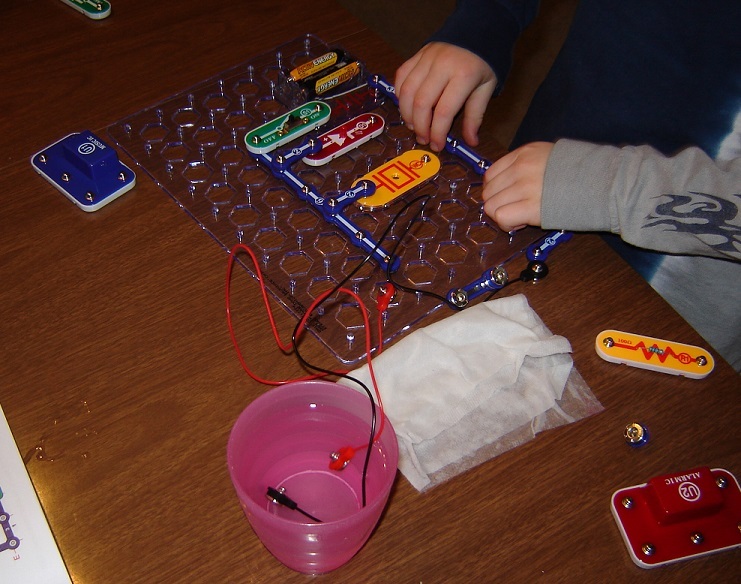 We were seeing if a soaked paper towel could complete the circuit too. It actually worked, although the alarm hardly sounded, so we got to learn something. I want to try it again using distilled water, which doesn't conduct (much) electricity. This was totally worth the $25. 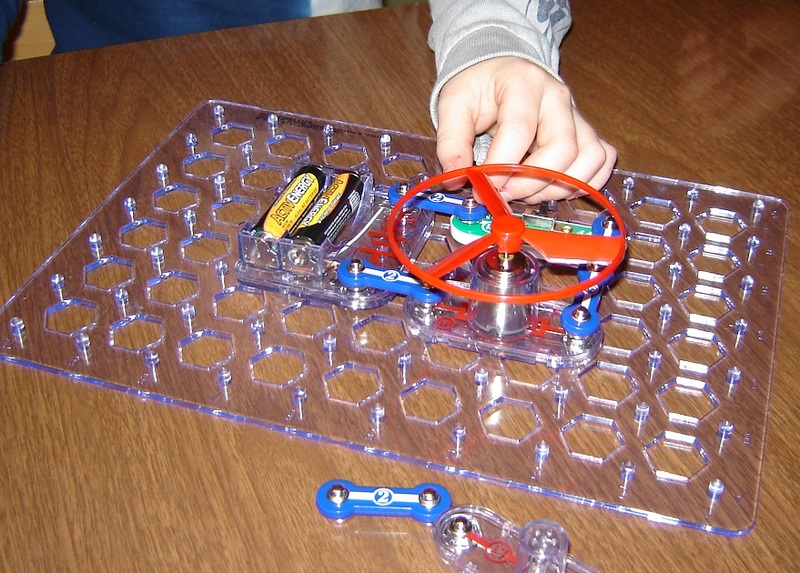 My kids took to it very easily, and have been playing with it first thing in the morning for the last week. I’m already looking forward to getting some extension packs in the future. Maybe the upgrade kit? The first few pages of the manual describe the parts in a little more detail, along with some tips and best practices. 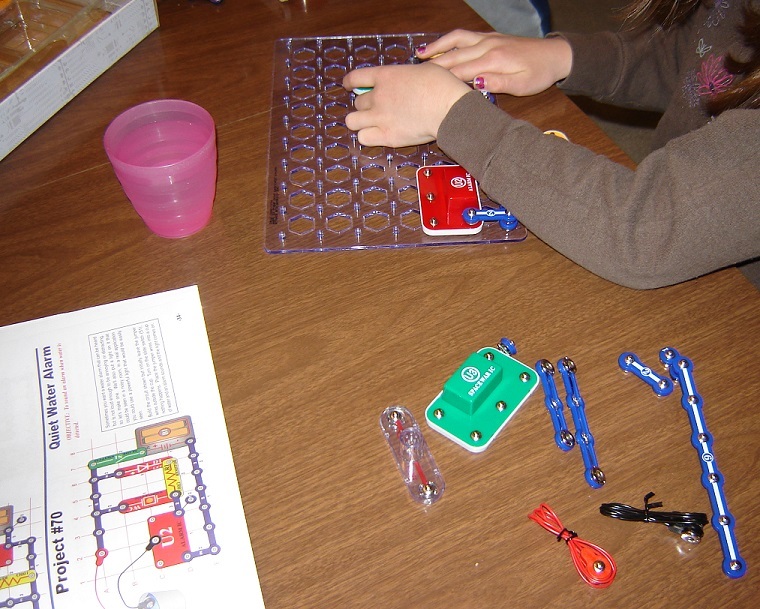 For more useful detail, check the Snap Circuits Learning Center online, where you can also find videos and user-submitted plans that go beyond the projects in the booklet. 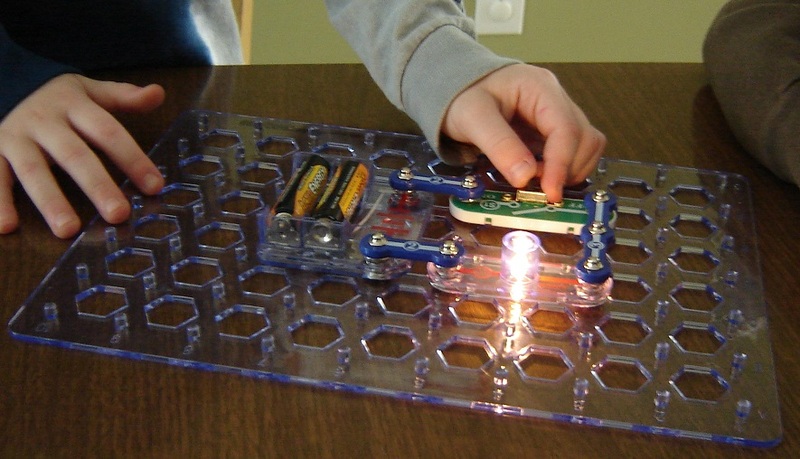 There are even some projects that can be made into games, such as the “quiet game” that has one player complete part of the circuit and cover it with paper, then the second player has to guess which two points will complete the circuit.